When it comes to spending your hard earned money we all want the same thing, value and quality. For the past few weeks I have been trying out some baking products from Aldi in my day to day baking and blogging. Top of the list for me was the pantrys strong white flour and fast acting yeast. This is new to their baking range and I feel will be a big hit for Aldi as it is not possible to buy a shops own brand strong flour. So as a consiquence strong flour can be expensive, which in turn could put people off experimenting with bread making. I really liked the 1.5 kilo size bag ,for making bread at home this for me is perfect. It will fit in my press with ease as it's not as big as my plain flour or my whole wheat flour as they are 2kilo bags but yet it's still a decent size bag and if weighed wisely you will get 3 loaves from it. The flour it self had that silky almost creamy texture that other popular brands have that I and many others have used over the years. The fast acting yeast was identical to two other brands I had in my press and when asked to spot the aldi brand yeast no one could desipher from the three. On the side of the flour bag was a recipe idea for strong white flour. 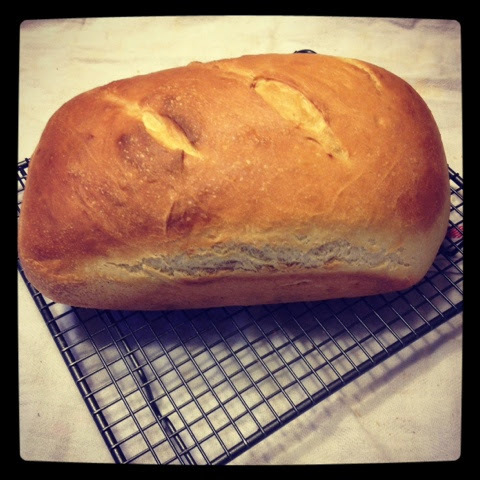 It's a perfect starter recipe to get your feet wet in the world of bread making. The big thing with bread making is precision and patience if you can remember that this recipe is a sinch. In a bowl mix the flour salt and yeast together. Add the olive oil and warm water then mix all together with your hand. I decided to use my kitchen aid with the dough hook attached. It says in the recipe to knead by hand on a floured surface for five minutes usually you would allow less time in the mixer but I felt it needed the five, when I tried this recipe by hand while the mixer was hard at it I actually needed to knead it for approximately eight minutes. Shape your dough into a ball by tucking the dough under itself as you slightly turn it then pop it in a large bowl and cover with a tea towel. Slash the top of the loaf with a sharp knife and pop in the oven at 220c for 30 minutes if not golden brown leave for a few extra minutes. I took the loaf out of the tin and popped it back in the oven for a few extra minutes. I found the flour and yeast to be extremely easy to work with and of high quality. The bread turned out fantastic very flavourfull and disappeared within hours. I look forward to seeing these products on Aldis shelves.